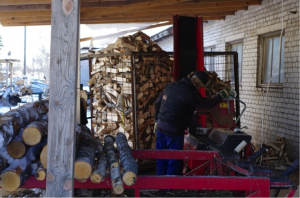 Birch firewood is known for its high calorific value per unit volume. It burns clean and doesn’t pop. Birch bark contains oils that make it burn well. When the bark is split into thin sheets it will make a really good ignition material since it catches fire easily. Our firewood is kiln dried to just right moisture content around 12 to 20 per cent. If the moisture content rises above 20% the logs will be harder to ignite and the burning wood will start to sizzle. If the moisture content rises above 30% you will start to see water bubbles rising on the end grain when the log is heated. The wood will be remarkably hard to burn. Kiln drying also enables us to provide firewood supplies year around. The firewood is split into 25 to 40 centimeter logs depending on the particular packaging type. Diameter of the logs varies from 4 centimeters to 18 centimeters. Max. 20 % of the logs are less than 8 cm or more than 15 cm in diameter. The firewood can be ordered in different convenient packaging. All types of packages are fitted on pallets for easy handling, keeping in mind an optimal utilization of transport equipment. If you have any questions regarding our firewood products or you would like to order feel free to contact us.